Safely delaying a sous vide cook is arguably the greatest benefit to having a WiFi enabled sous vide machine, especially if you are often out of the house when you want to start a sous vide cook. In order to delay the start time, use a combination of ice and water to keep your food out of the danger zone until you are ready to start cooking it. You can learn more about how and why to delay a sous vide cook. 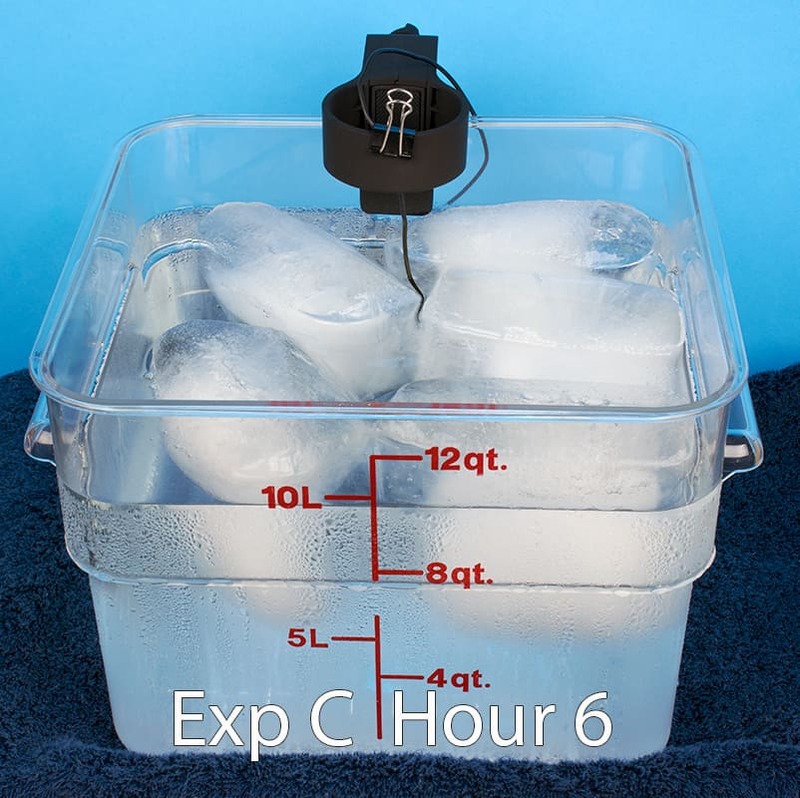 Because keeping the food cold is critical to safely delaying the start time, I wanted to more closely examine just how long a combination of ice, water, and food will actually stay cold when sitting out at room temperature. To accomplish this, I ran a series of experiments that monitored the temperature of the water over time. The rest of this article talks about the experiments and shares the results. For my conclusion you can hop directly to the summary section. Do you worry you're not getting the most out of your sous vide machine? Quickly level up your sous vide game! Make perfect meats, master searing, and discover the sous vide times and temperatures you need to make everyday food amazing and impress your friends and family with the Exploring Sous Vide email course! The experiment is quite straightforward. First a combination of water and ice totaling 2.6 gallons (10 l) was put into a container. Next the temperature of the ice bath was monitored over a 13 hour span to determine how long the temperature of the water bath stayed under 40°F (4.4°C). The contents of the water bath were not stirred or mixed in any fashion during the duration of the experiment. This simple experiment was performed 6 times. In each case one of the various parameters was changed to gauge its impact on the amount of time the ice kept the temperature in the safe region. There were only two pieces of equipment used; a water bath container and a temperature logger with probe. 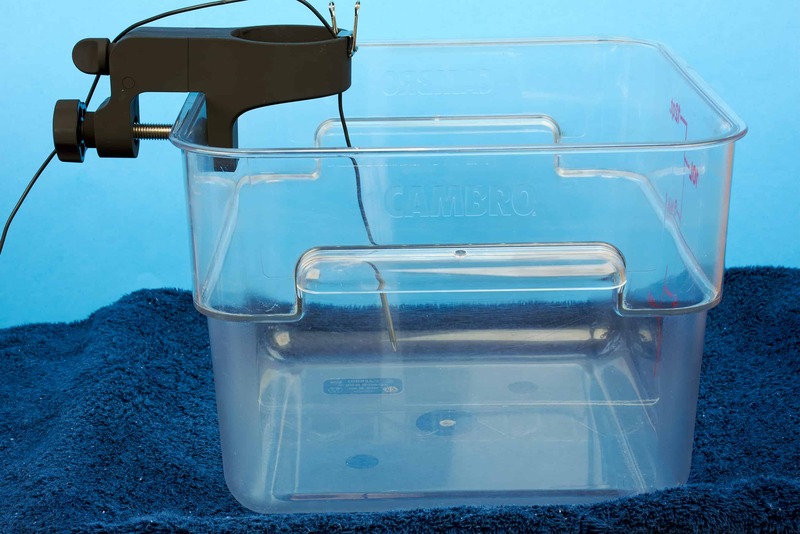 For the water bath container I used the 12 Quart Camwear Polycarbonate Square Food Storage Container by Cambro. This is the container I use for nearly all of my sous vide cooking. Since the outside of the container was relatively cold there is quite a bit of condensation created. That is why I placed the container on a folded towel positioned in a baking sheet with raised edges. 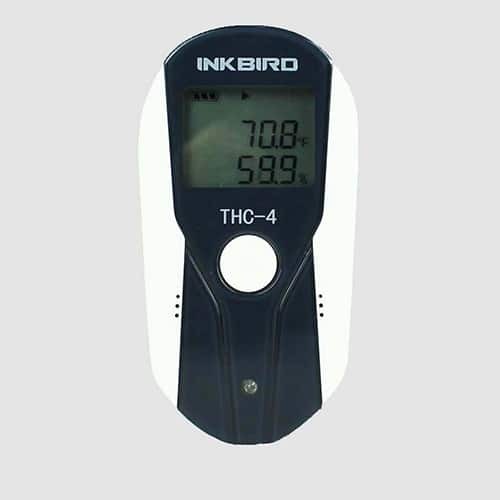 The data logger comes with data management software which you can load on your PC. This software allows you to adjust the various parameters in the data logger such as the record interval, time and date, calibration values and temperature units (°F or °C). It also allows you to view the data collected numerically as well as various graphical forms. In addition, you can download the data to a variety of file types including Excel. 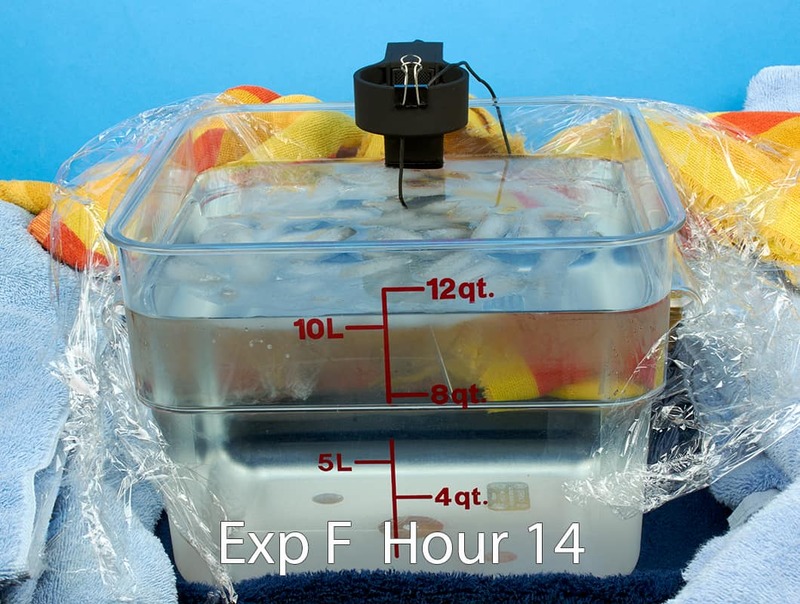 As you can see from the pictures I used the clamp from my Anova Precision Cooker to connect the temperature probe to the water bath container. I adjusted it so that the tip of the probe was near the center and approximately 2" (5.08 cm) from the bottom of the water bath, which is where most food would sit in the water. There are four different parameters associated with this experiment. Each of them is described in detail in the following sections. As mentioned above, a polycarbonate container was used for the water bath. In the majority of cases this was simply left "Open". But in two cases we did insulate the top and sides with bath towels to see what the overall impact would be on the performance of the ice bath. From our earlier experiments with heating a water bath, we knew that an insulated water bath heated up faster. 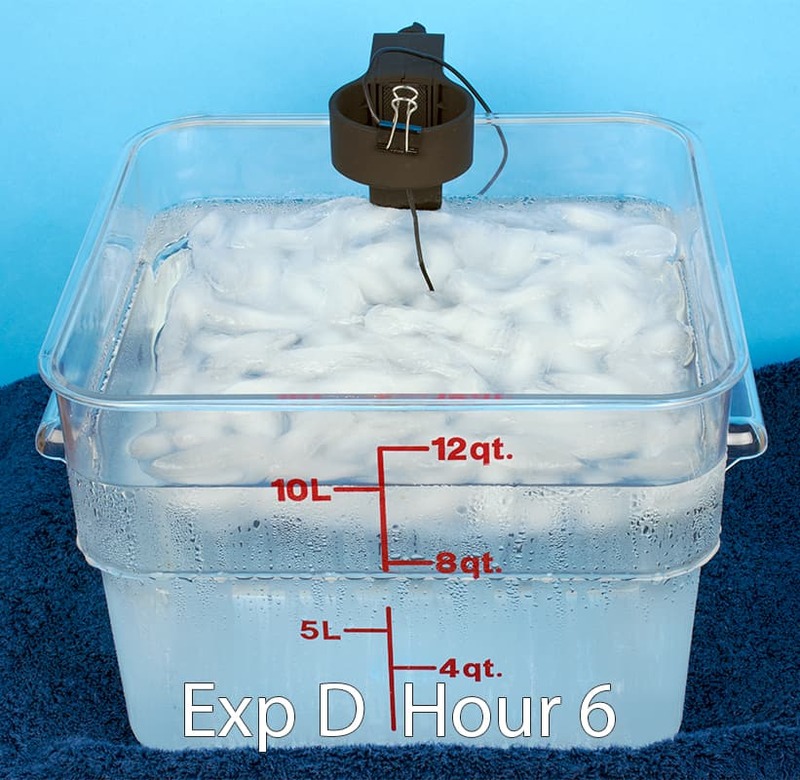 Therefore, we suspected that an insulated water bath would also remain cold longer, but we just didn't know how large of an impact it would have. Two different types of ice were used to see what their impact would be on the performance of the ice bath. The first was just crescent shaped cubes from the ice maker in my Whirlpool refrigerator. You can see these in the picture above. I show them in the container from the freezer that I collect them in. 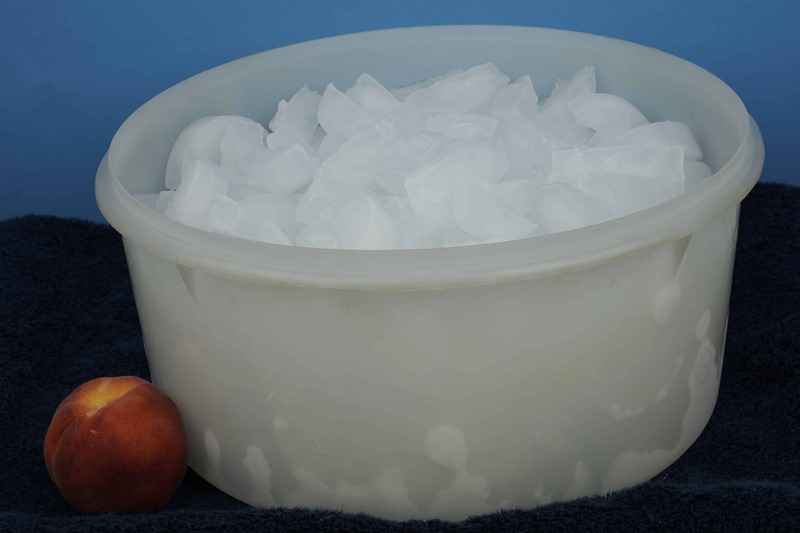 The peach is to give you an idea of the size of the container, and thus the amount of ice cubes that it takes to create a 2.6 gallon (10 l) 50% ice water bath. 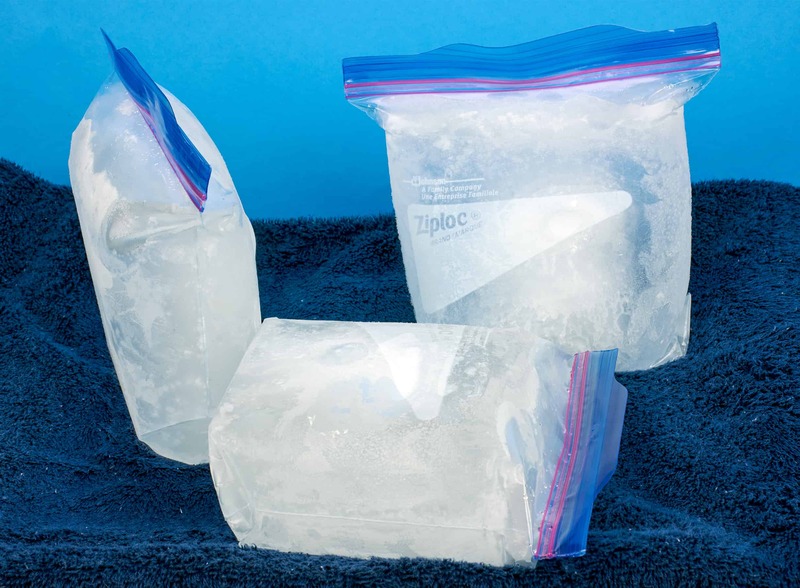 The second type of ice used was created by freezing 1.05 qt (1 l) of water in a quart-size Ziploc bag. When we used these we cut the bag off in order to get the chunk of ice out. From what little I could remember from my college thermodynamics class, it seemed like these bags would probably last longer since the ratio of surface area to volume was lower than with cubes. In theory that should make it melt slower - and it did. Two sources of water were used to create the ice bath. One was just cold water from the tap. I would let the water run until it seemed to be as cold as it was going to get, and then filled the water bath container. The second source of water was from 2-liter bottles stored in the refrigerator. The water in these bottles was typically about 15°F colder than from the tap. It only makes sense that the cooler the water starts out, the longer it will remain under the danger zone. The final parameter that was varied was the percentage of ice in the ice bath. Most of the experiments were run with an ice bath comprised of 50% ice. I did not want to go over 50% since; that's a lot of ice, and you need to leave room for the food that you are cooking. In order to create a 50% ice bath I would first fill the water bath container with 5.3 quarts (5 l) of tap water or water from the refrigerator. 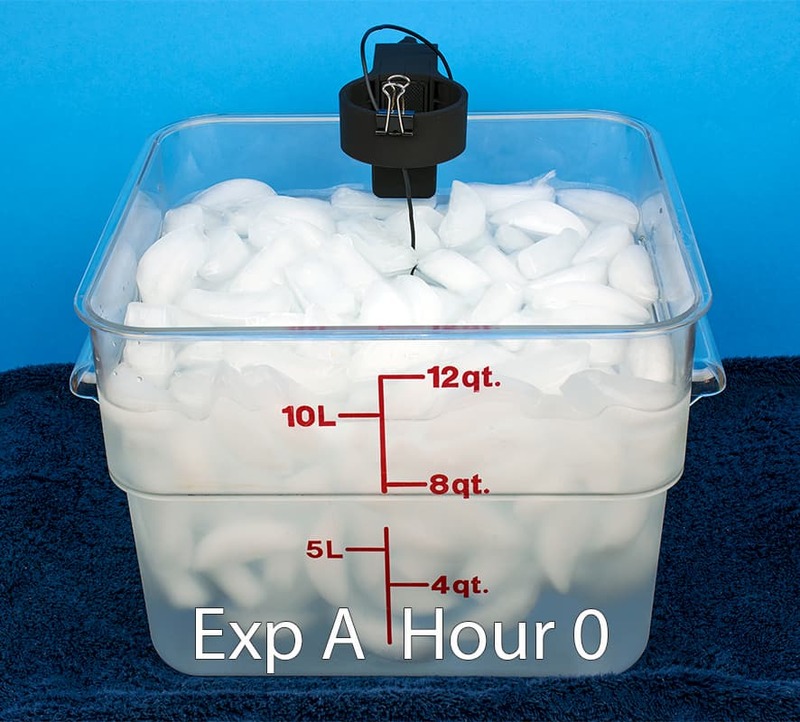 I would then add ice until the water level came up to 10.6 quarts (10 l). Six different experiments were run using various combinations of the four parameters mentioned in the previous section. These experiments were labeled "A" through "F". Each of the experiments will be described below along with some pictures of interesting times during the experiment. This experiment was run with an open container, water from the tap, and 50% ice cubes. The first picture is of the ice bath at time zero. This will give you an idea of how much ice it takes to create a 50% ice bath. The second picture shows the ice bath after eight hours, which is shortly after the temperature rose into the danger zone. This is very similar to Experiment A, except that water from the refrigerator was used rather than just tap water. The first picture is of the ice bath at time zero. The second picture shows how much ice is left after 10 hours, which is about 30 minutes after the water temperature entered the danger zone. This is very similar to Experiment B, except ice bags were used rather than ice cubes. Keep in mind that the Ziploc bags have been removed, so these are essentially just 5 big chunks of ice. The first picture is of the ice bath at time zero. You can see that the five chunks of ice don't leave a lot of room for the food you're going to sous vide. The second picture shows how much ice is left after 6 hours. The third is how much ice is left after 12 hours, which is about when the water temperature entered the danger zone. This is very similar to Experiment B, except the bath had only 30% ice. The first picture is of the ice bath at time zero, you can see that it has significantly less ice than Experiment B. The second picture shows how much ice is left after 6 hours, which is about when the water temperature entered the danger zone. This is very similar to Experiment B, except the water bath was insulated using bath towels on all sides and the top. The first picture is of the ice bath wrapped in the towels. The top of the container had about six layers of towel, and the four sides about four layers. The second picture shows how much ice is left after 13 hours. In this case the water temperature was still at 33.1°F, with plenty of ice left. After taking the picture, I replaced the insulation and the bath continue to stay out of the danger zone for more than 30 hours! This is a fairly unique experiment that uses a water bath insulated with bath towels on all sides and the top. It also uses a bath of tap water and only 25% ice. The first picture is of the ice bath before being wrapped in the towels. The second picture shows how much ice is left after 14 hours, which is when the water temperature was just beginning to enter the danger zone. To simplify the explanations in this section, I would like to use the term "Cold Zone" to refer to water bath temperatures below 40°F (4.4°C), i.e. colder than the danger zone. Consequently, in order to safely delay a sous vide cook, we want to keep the food in the Cold Zone until the time we turn on the immersion circulator to heat the water to our target temperature. 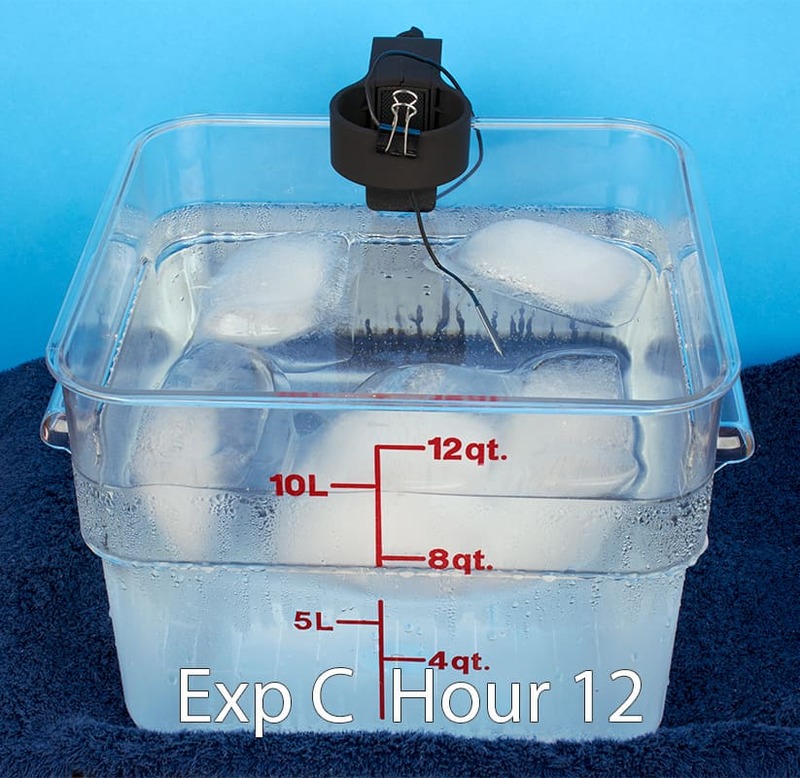 The table below lists the temperature of the water bath, at each hour, for the six experiments that were described in the previous section. The bottom row on the table records the amount of time that the water bath remained in the Cold Zone for each of the experiments. Please refer to this table as you read through the following section. Chart Note: The temperatures shown in the table as bold and underlined indicate there is a picture in the previous section which shows what the ice bath looked like at that point in time. In the remaining portion of this section we will examine how each parameter impacts the length of time the ice bath remains in the Cold Zone. Hopefully, this will allow us to make a few suggestions as to which combination of parameters is the easiest to use in order to obtain the length of time in the Cold Zone that you require for your delayed sous vide cook. I have to confess, I was blown away by the impact of the insulation on the amount of time the ice bath stayed in the Cold Zone. 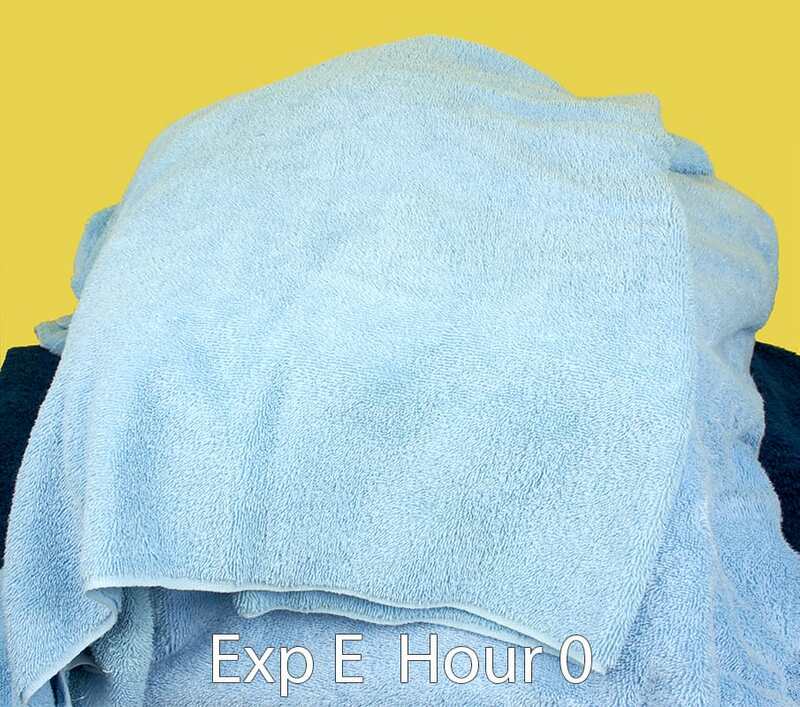 By wrapping the ice bath in bath towels it extended the time in the Cold Zone from 9:29 (Experiment B) to more than 30 hours in Experiment E. I didn't see that coming! In addition to having the largest impact on extending the time in the Cold Zone of all the parameters we tested, insulating the container has two other advantages. It is the easiest thing to do - we all have a few bath towels laying around we can use for this purpose. It's a lot simpler than making/collecting a lot of ice or even taking the room in our refrigerator to chill the water. It's just the simplest solution. Similar to the way the insulation keeps the cold in, it will also keep the heat in once the immersion circulator is turned on to bring the bath to the target temperature. This will allow the water bath temperature to move through the danger zone a little bit faster - which is a good thing. If the container you use to sous vide is already insulated, like the picture on the right, then you are already in pretty good shape to create an effective ice bath. 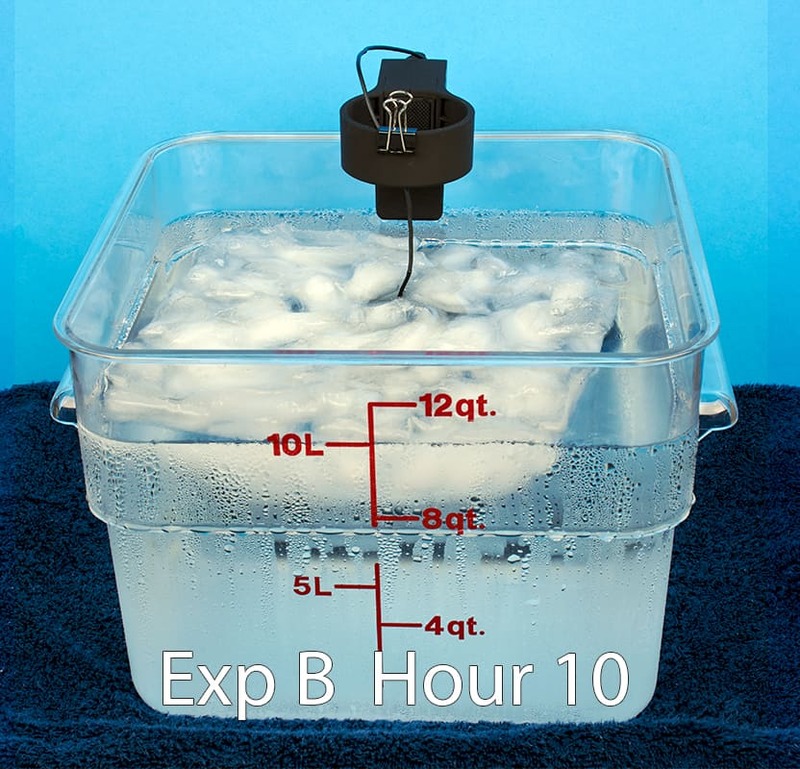 You can get a pretty good idea of the impact of the initial water temperature by studying Experiment A and Experiment B. In both these experiments everything was the same except the starting temperature of the water. There was a difference of approximately 20°F. 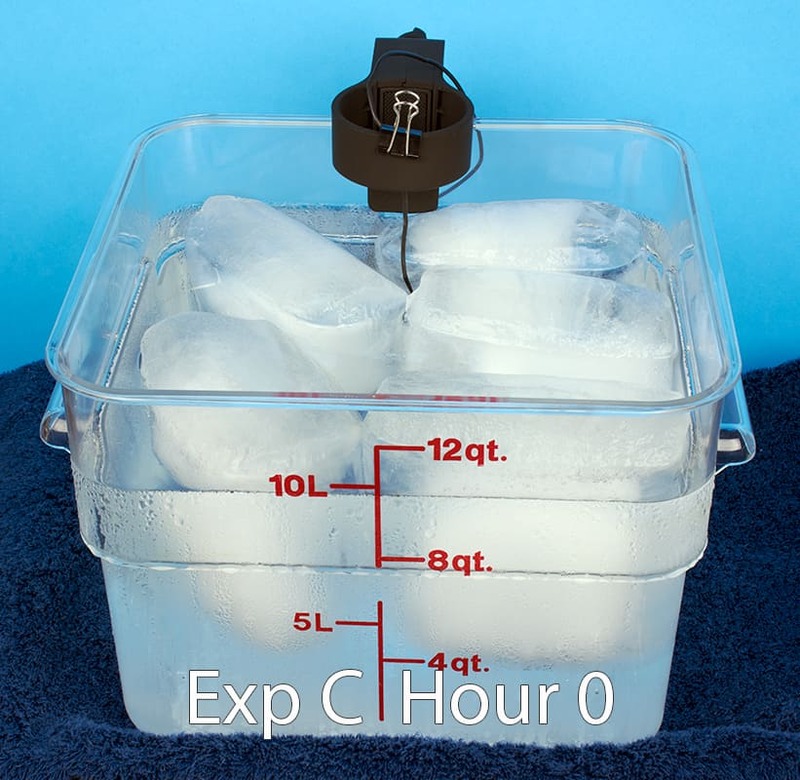 Since the initial temperature of the water was colder, the water bath stayed in the Cold Zone approximately 1.5 hours longer in Experiment B. Of course the impact here will depend a lot on the differences between the two temperatures for your particular situation. The water from your tap may be cooler than mine, ~57°F (14°C), and/or your refrigerator at a different temperature, ~37°F (3°C). But in general you can probably extend the time in the Cold Zone from 1 to 2 hours by chilling the water in your refrigerator. 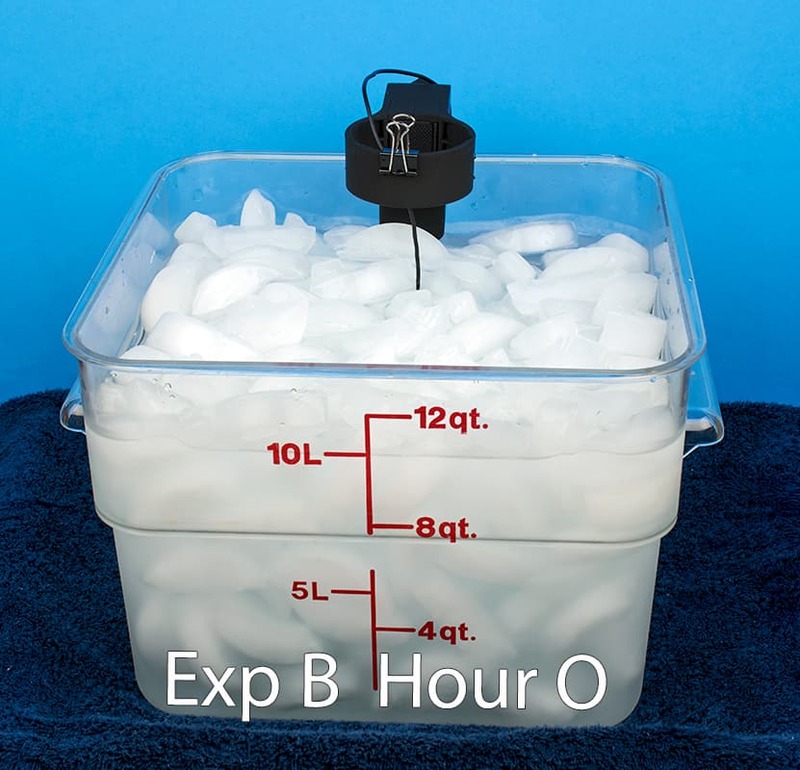 By comparing Experiment B to Experiment C you can get a feel for how the type of ice may impact your ice bath. 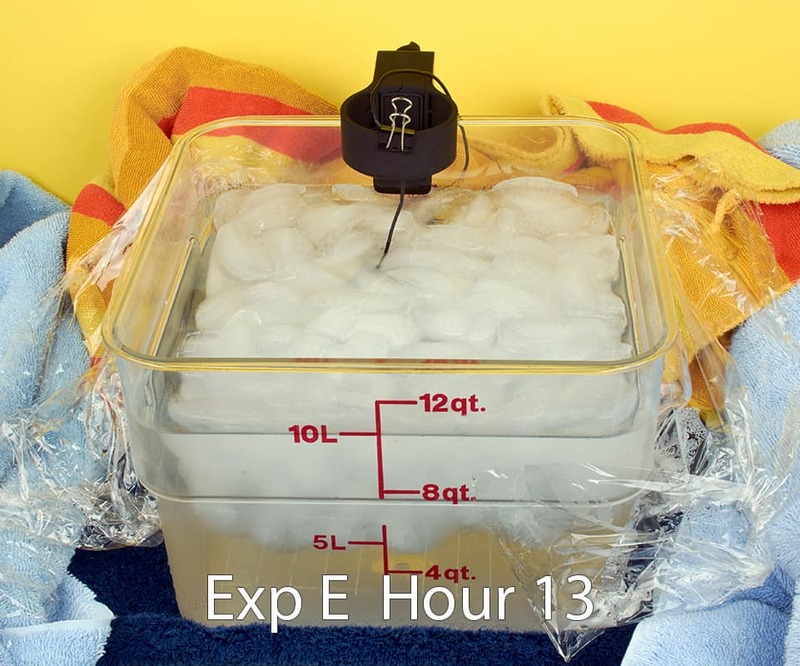 By using ice "bags" rather than ice cubes, the duration in the Cold Zone was extended by nearly 3 hours in Experiment C. This is because the 5 large chunks of ice simply melted slower thus keeping the ice bath at a lower temperature longer. Although this is an effective way of extending the duration of the Cold Zone, there are a few disadvantages. Actually making the ice bags is a bit challenging and they definitely take up room in your freezer. You also have the expense of the Ziploc bags which you need to cut off in order to free up the ice chunks. Of course you can eliminate this expense by creating ice chunks in other types of containers, which you can reuse. And finally, the chunks of ice take up a significant amount of room in your water bath, potentially making it difficult to put in all the food that you'd like to sous vide. This parameter is perhaps the most intuitive since it simply makes sense that the more ice you add the longer the time in the Cold Zone will be. 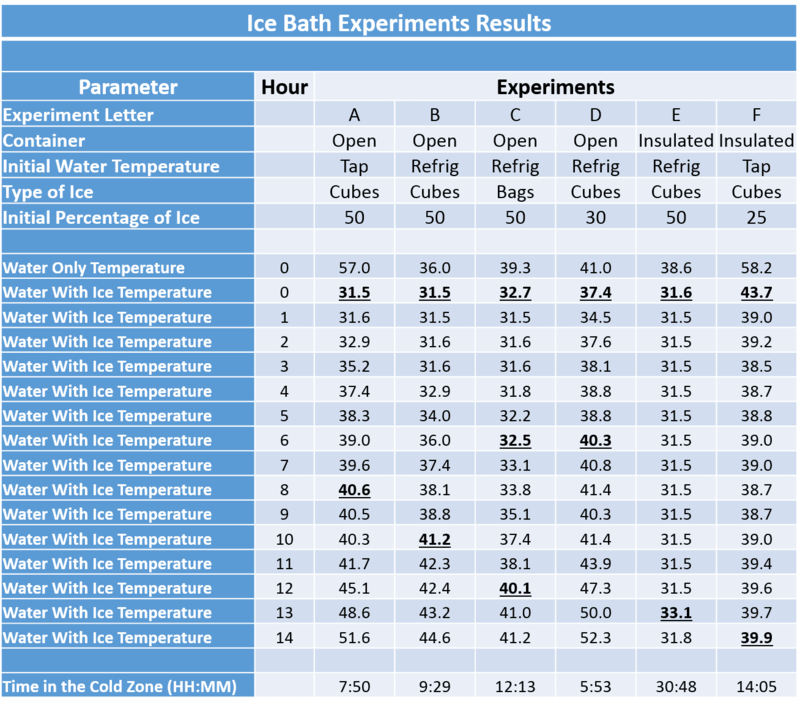 As you can see by comparing Experiment B to Experiment D, the amount of ice has a pretty dramatic impact on the duration of the bath in the Cold Zone. 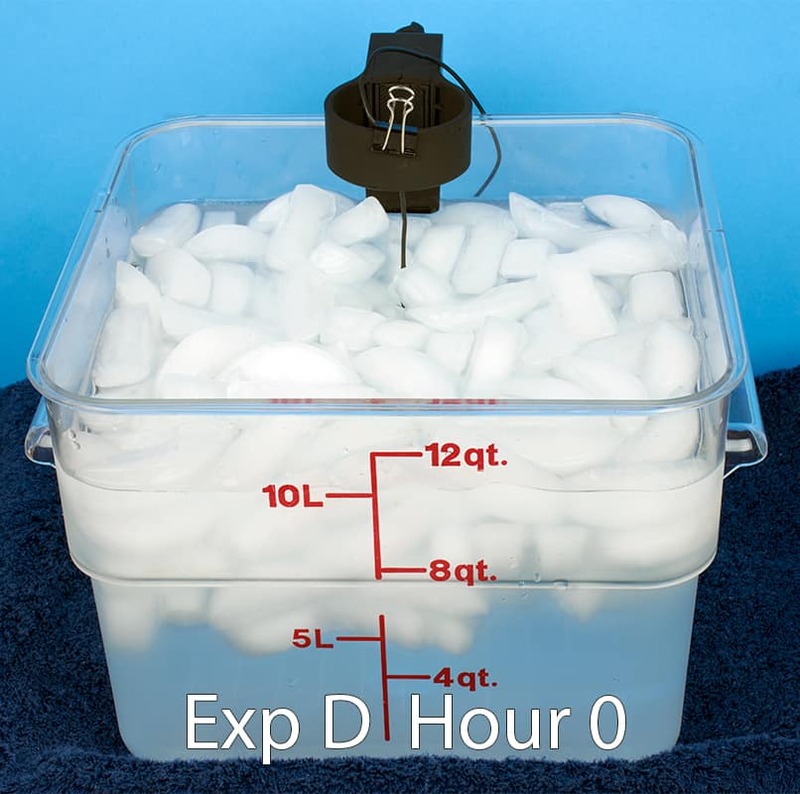 By dropping the percentage of ice from 50% down to 30% reduced the duration by more than 3.5 hours. It clearly makes sense to use as much ice as you can, unfortunately, sometimes this can be a challenge. If you don't have an ice maker in your refrigerator, it could be an arduous process to collect a large amount of ice. And even with an ice maker you need to have room in your freezer for a large container to collect the ice in, as shown in an earlier picture. However, you can get around these issues by purchasing a bag of ice at the store when you're about ready to start your delayed cook. We want to make it very clear that these ice bath experiments are not an exact science. There are numerous factors that may impact how safe your food is that we were not able to account for in detail. Our goal with these experiments is to get you in the "right ballpark", from which you can then carry on your own experiments with your equipment and in your environment. In this section we list some of the reasons why we say this is not an exact science. As mentioned earlier the danger zone is defined as the temperature range from 40°F to 130°F (4.4°C to 54.4°C). Please keep in mind that moving into the danger zone is not exactly like flipping a switch; where at 40°F (4.4°C) there is no bacteria growing and at 41°F (5.0°C) bacteria is thriving. The growth of bacteria actually starts quite slowly as you move into the danger zone. Foodborne microorganisms grow much faster in the middle of the zone, at temperatures between 70°F and 117°F (21°C and 47°C). Therefore, if the temperature of the food remains close to the 40°F (4.4°C) lower boundary of the danger zone, the growth of microorganisms is still pretty well retarded providing you a small buffer. As I mentioned earlier, the temperature probe was located near the center of the bath and approximately 2" (5.1 cm) from the bottom of the container. Since the ice floats, I suspected that the top of the water bath would be cooler than near the bottom. To test this I took measurements at three different depths of the ice bath over a five hour period. I took measurements at: approximately 1" (2.5 cm) from the top of the water, about the middle of the water and approximately 1" (2.5 cm) from the bottom of the container. I have to admit I was quite surprised to find out that, after about an hour, the difference in temperature from the top measurement point to the bottom one averaged about 7.5°F! Consequently, the temperature surrounding the food in the bath could vary greatly depending on its depth in the water bath. When you are doing a delayed sous vide cook you may be able to have water bath temperatures reported to you by the immersion circulator. Numerous factors could impact the temperatures it reports. As highlighted in the previous section, the location of the temperature sensor in the immersion circulator would be an important factor. If the sensor is located near the bottom of the circulator, the temperatures reported would be higher than if it was located near the middle or top of the circulator. Fortunately, I believe most immersion circulators have the temperature probe close to the bottom of the circulator tube. The temperature sensors in immersion circulators are located inside the tube that is in the water. Often times the ice will make direct contact with this tube. If the tube is made from stainless steel (e.g. Anova, Gourmia), the cold temperature from the ice will be transmitted efficiently to the water inside the tube, cooling it down as well. However, if the tube is poly carbonate (e.g. Joule, Sansaire), a lesser amount of the cold will be transmitted to the water inside the tube. Therefore, a higher temperature will be reported. 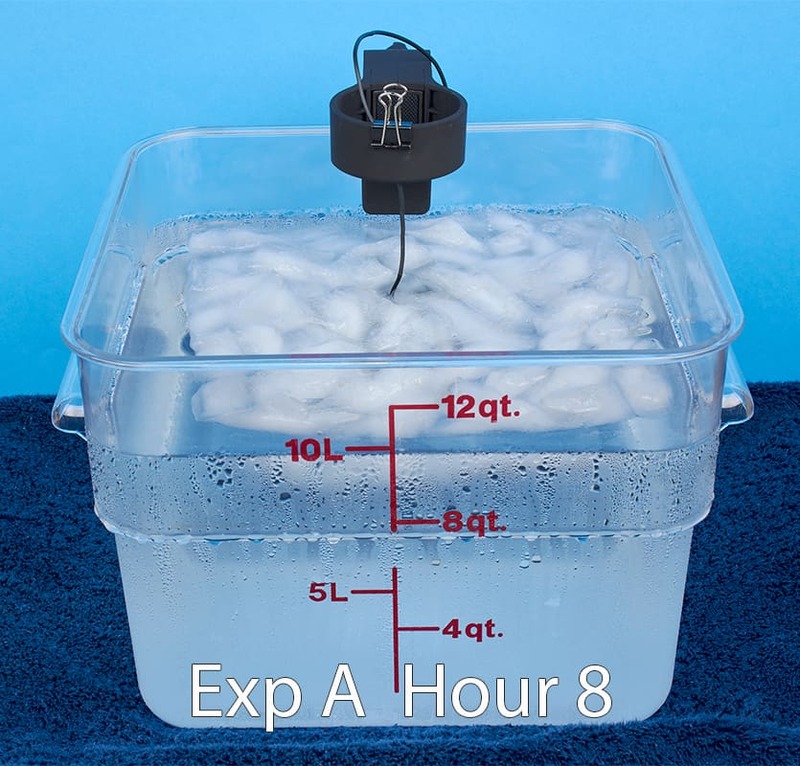 Is the Water Bath Circulated by the Immersion Circulator? It would be ideal if WiFi immersion circulators would occasionally turn on the pump and circulate the cold water in the ice bath. This would go a long way towards assuring that the temperature in the ice bath was relatively consistent throughout. It would also probably improve the accuracy of the temperature being reported by the unit. It goes without saying that if the food you are cooking is out of the freezer, rather than the refrigerator, it will stay cooler than the danger zone temperatures for longer. Unfortunately, it is difficult to determine exactly how much longer since it depends on many factors including the size, shape, and thickness of the food. If you are interested in exploring this topic in a little more detail you can see how the sous vide heating times for beef, lamb and pork vary with their shape, thickness, and initial temperature. Another important parameter that impacts how long an ice bath stays cold is the external temperature of the room where the ice bath resides. I chose not to experiment with this parameter since it's by far the most difficult for a user to manipulate. I don't think we want to run our air conditioner in the summer to get the house down to 65°F (18.3°C), just so our ice bath stays cool for another 30 minutes! For the record, the external temperature for these experiments averaged around 71°F (21.7°C). When performing a delayed sous vide cook most of our focus is on keeping the ice bath cooler than the danger zone until it's time to start the cook. However, another safety factor is how much time the water bath stays in the danger zone once the immersion circulator is turned on. The three factors that have the most influence over this time will be discussed next, followed by a summary of an experiment performed to measure this time. If you planned your ice bath correctly, there will always be some ice remaining when it's time to start the cook. Obviously, the more ice that's in the bath, the longer it will take for the immersion circulator to heat the water to a "safe" temperature. Fortunately, during the time when the circulator is melting the ice, the water bath temperature will remain close to the bottom of the danger zone. By viewing our Sous Vide Machine Benchmark Results you can see that different immersion circulators take different amounts of time to raise the temperature of the water bath. When we are doing a delayed sous vide cook we need to raise the water from 40°F to 130°F (4.4°C to 54.4°C). And we like to do this as quickly as possible. 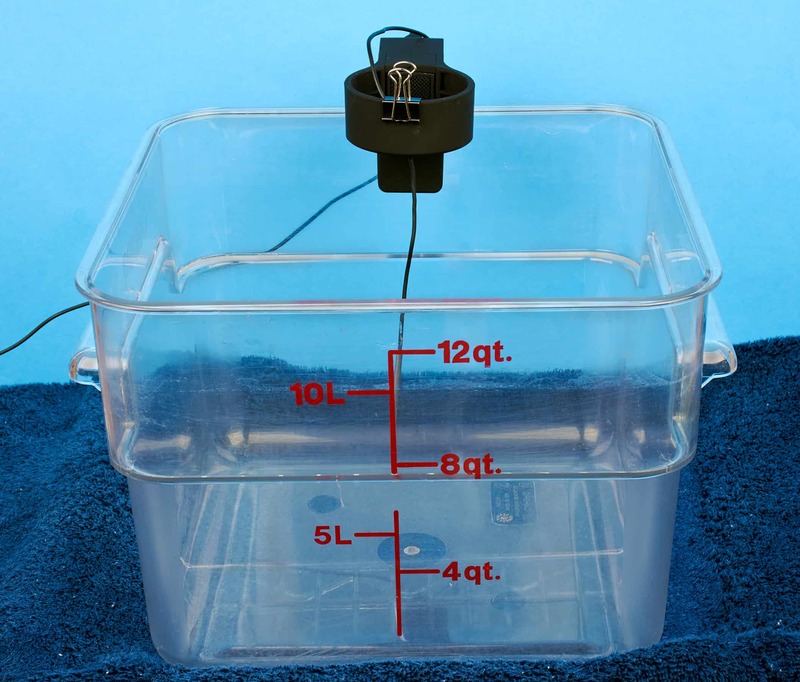 When we looked at the Sous Vide Power Consumption Benchmark Results from an earlier post, we see that insulating the water bath container can reduce the amount of time to heat up the water bath. Consequently, an insulated water bath should heat through the danger zone quicker than an open one. One experiment was run to get a feel for how long it would take for an immersion circulator to heat the water through the danger zone. You can see the setup used in the picture on the right. The water bath container was not insulated in any way and held approximately 11 quarts (10.5 l) of water. 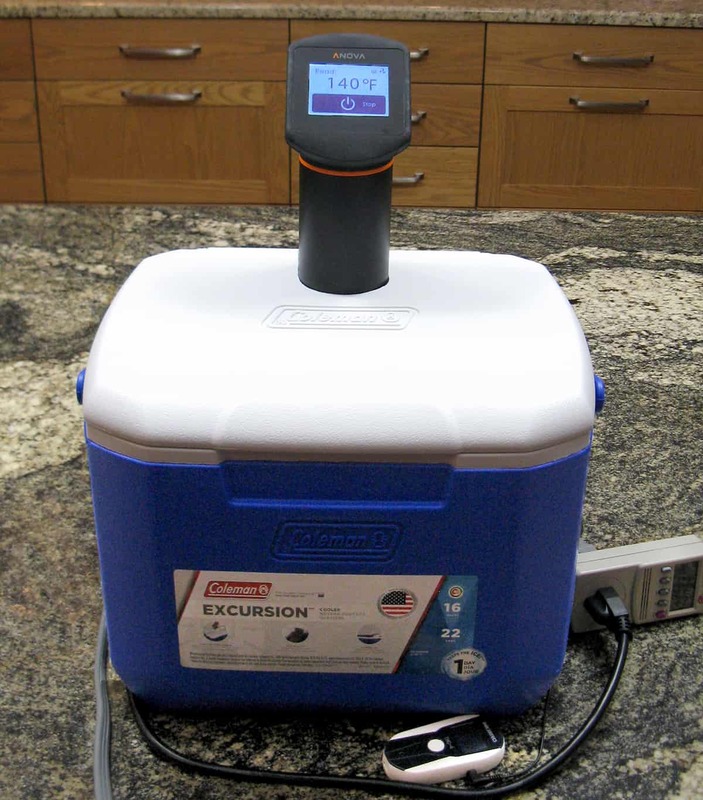 We chose the Anova Precision Cooker WiFi as the immersion circulator since it has less power than most other circulators. Therefore, the experiment would yield more of a "worse case" scenario. An ice bath was created using about 20% ice cubes in order to get the water temperature less than 40°F (4.4°C). The temperature was monitored both on the immersion circulator as well as the Temperature and Humidity Data Logger. The picture was taken when the immersion circulator was turned on, with a target temperature of 131°F (55°C). As you can see there is still a typical amount of ice remaining in the ice bath at that point. For this particular experiment, it took about 1 hour for the water bath to heat through the danger zone. So, it would probably be safe to estimate it's going to take between 45 and 65 minutes to bring an ice bath to a temperature greater than the danger zone. Please keep in mind that during this time the food in the bath is not cooking at the target temperature. Therefore, you need to remember to start the immersion circulator early enough so that the food is actually cooking at the target temperature for the length of time you desire. For example, in this case if we wanted to cook a steak for 2 hours and eat at 6 PM, we would need to turn on the immersion circulator at 3 PM to get the appropriate cook time. We chose to monitor and manipulate four specific parameters for our ice bath experiments. These experiments gave us some valuable information on the factors that impact how long a water bath stays in the Cold Zone. However, please keep in mind those additional factors mentioned in this section, which also impact the ice bath in a variety of ways. This brings us to our next, and perhaps most important section, which strongly encourages the sous vide cook to experiment in their own environment and with their own equipment, to find out what works best for them. We hope that the information we shared in this article will provide you with an excellent starting point for doing some experimentation of your own. Because so many factors can impact the duration of an ice bath in the Cold Zone, the only way to develop a strategy that works is to experiment in your own kitchen. First you need to determine how long you need to delay the cook for your particular scenario. Then use the information provided in this article to come up with a strategy that you believe will work well for you. Your strategy needs to include: the type of container you will use, the type of ice, where you get the water from for the bath, and how much ice you will use. When developing your strategy for the delayed sous vide cook it's important that you be conservative. You do not want the temperature of the food to creep into the danger zone before you're ready to start the cook. It is much safer to have to start the cook when there is still quite a bit of ice left in the bath. Once the circulator fires up the ice gets melted relatively quickly. Then test the strategy by running it while you are available in the kitchen during the entire cook, to be sure that everything runs as you suspected. Check the temperature of the water bath regularly to be sure that it's staying in the Cold Zone as you planned. 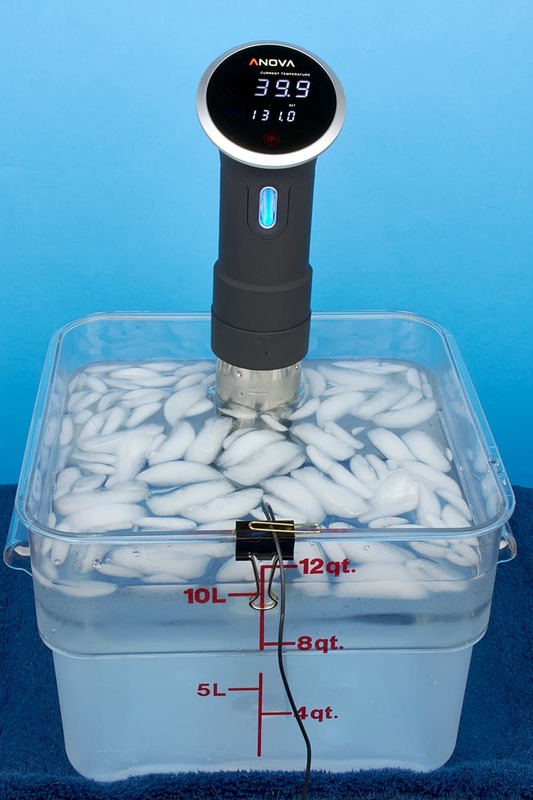 With WiFi capable immersion circulators becoming readily available, there will be more folks wanting to take advantage of the benefit that allows you to safely delay a sous vide cook using an ice bath. With WiFi you can start a sous vide cook while away from the kitchen, so that the food is ready when you return home. But it's critical to keep that food out of the danger zone during the time prior to initiating the cook. The best way to do that is by using an ice bath as described in this article. 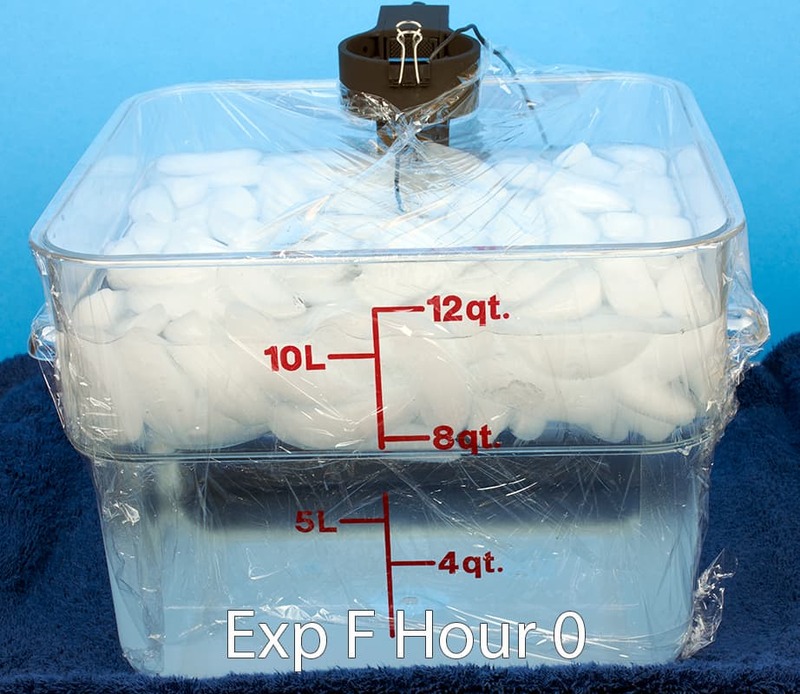 It is clear, from looking at the results of the six experiments we ran, that insulating the water bath container is both the easiest and most effective way to increase the amount of time the ice bath will remain in the Cold Zone. Adding more ice, and/or starting with chilled water, will also help to extend the duration. Depending on how long you need to delay the start of your sous vide cook, you may want to consider trying a strategy similar to Experiment F, since it is probably the easiest to implement. It benefits from the additional time that's gained by insulating the water bath with towels. You can use just tap water and about 25% ice, reducing the amount of space you need to find ahead of time in your freezer and refrigerator. Since there are so many factors that can contribute to the warming up of the ice bath, we strongly encourage you to first experiment with your strategy while you can periodically check on its progress. This will give you the confidence that when you do your first "long distance" delayed sous vide cook, that it will be a safe one. If you have experience delaying the start of a sous vide cooked using an ice bath, I would appreciate you sharing it in the comments below. Thanks.